Jubilee French Restaurant: C’est Si Bon! Above Image Courtesy of Jubilee, All Other Photos By Anne Raso. Do you like French food? I sure do. Recently, I was invited to dine with a couple of friends at Jubilee, an authentic French eatery that’s just a short trip up First Avenue from my east village flat. Owned and operated by Eric Macaire, head chef Luc Holie (formerly of the late, great L’Absinthe) and his amicable wife Ilda (the couple hail from Montpelier and Paris, respectively), Jubilee is a neighborhood gem whose warmly decorated interior is elegant while remaining comfortable, cozy and charming. I felt welcome right away. Jubilee has a huge following for its fresh Mussels (Moules), prepared with your choice of sauces including Marinière, Curry, Poulette, Catalane, Dijonnaise, Citronnée, Tomato Basil, Asian and Calvados (or choose a trio of sauces). Mussels are served ala carte for $17 or with French Fries or Salad for $23.50. Keep that in mind if you have friends who are mussels fans! Enjoy these photos of our menu choices! As a first course, I enjoyed the Terrine de Foie Gras de Canard avec Compote de Fruit ($19), Chef Luc’s Homemade Terrine of Duck Foie Gras with a Balsamic Reduction and Fruit Chutney. 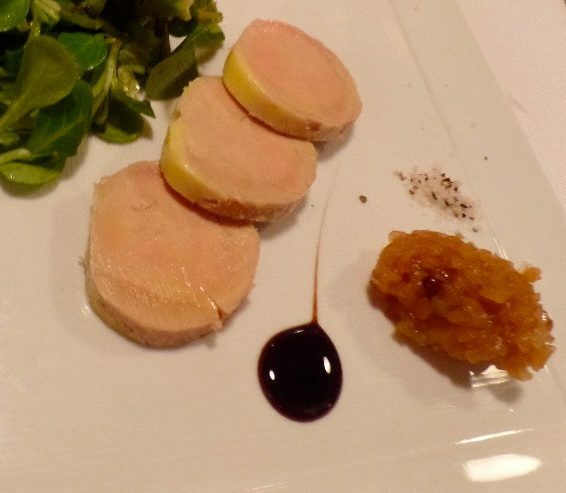 The generous portion of this buttery Foie Gras is ultra creamy and mild, with the tart balsamic presenting a nice flavor counterpoint. The bright sweetness of the fruit chutney is also nice complement, and adds welcome texture. This dish is very rich and I suggest sharing so as not to dampen your appetite for your main course. Both of my dining companions ordered the Salade de Tomates d’Heritage avec Mozzarella et Vinaigrette au Balsamique ($13). 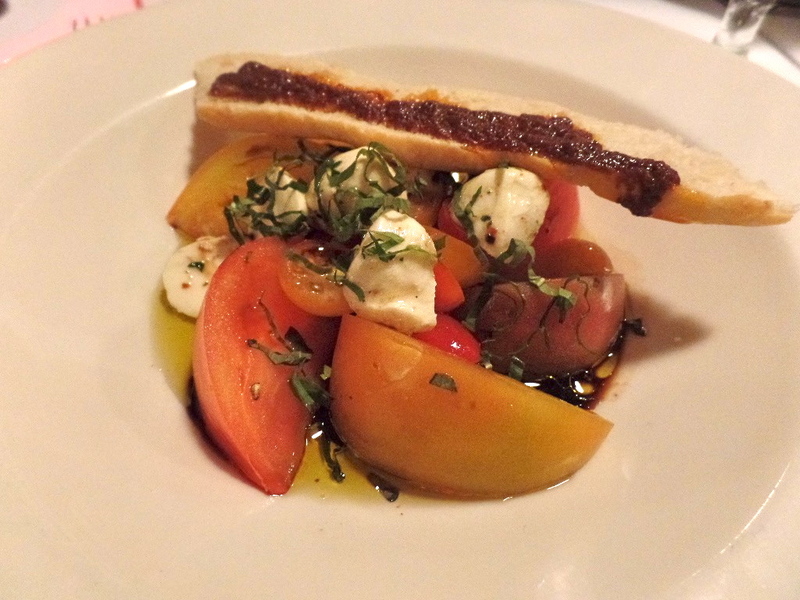 This fresh Heirloom Tomato Salad with Mozzarella and Balsamic Dressing arrives drizzled extra virgin olive oil and sprinkled with fresh basil, with a toasted baguette “crouton” garnish. Fish lovers might enjoy the Loup de Mer aux Tagliatelles de Courgettes, Bouillon de Tomate Séchée ($29), Striped Bass, Zucchini Tagliatelles and Sundried Tomato Broth. The fish arrives with a gorgeous, browned crispy skin! Meat lovers have plenty to choose from on Jubilee’s extensive menu. The Steak de “Black Angus”($35) is a Grass Fed 10 oz Black Angus Steak, served with French Fries and Salad, with choice of Green Peppercorn or Bearnaise Sauce. One of my friends chose to substitute her fries for a side of fresh sauteed Brussels Sprouts, as she was watching her carbs. The requested, off-menu substitution was made with a smile! Take a look at this luscious Côte de Boeuf ($40), a Grass Fed 14 oz Rib-Eye Steak, which was my entree. Also served with French Fries, Salad and a choice of Green Peppercorn or Bearnaise Sauce, we asked for both sauces and shared them. Divine! The meat was perfectly marbled with an excellent exterior char, and the crispy french fries were plentiful. 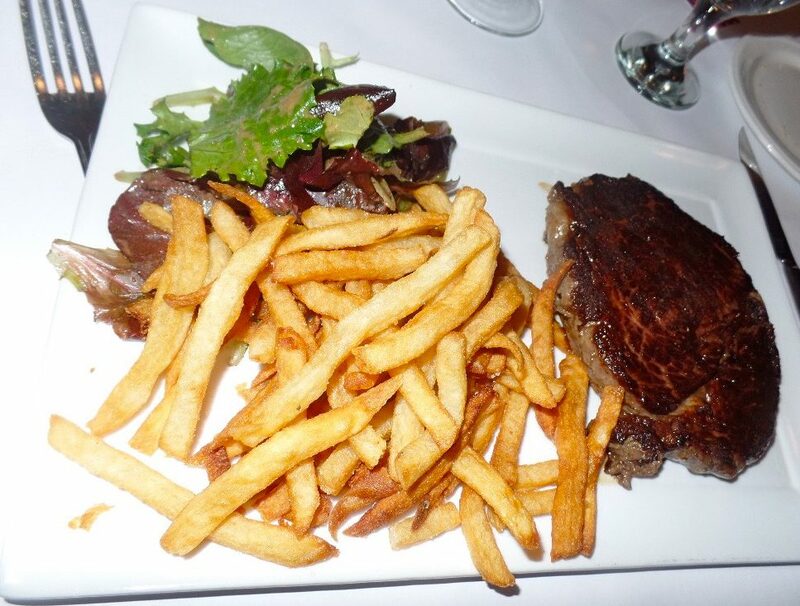 The classic French bistro meal of Steak Frites surely does not get better than this. 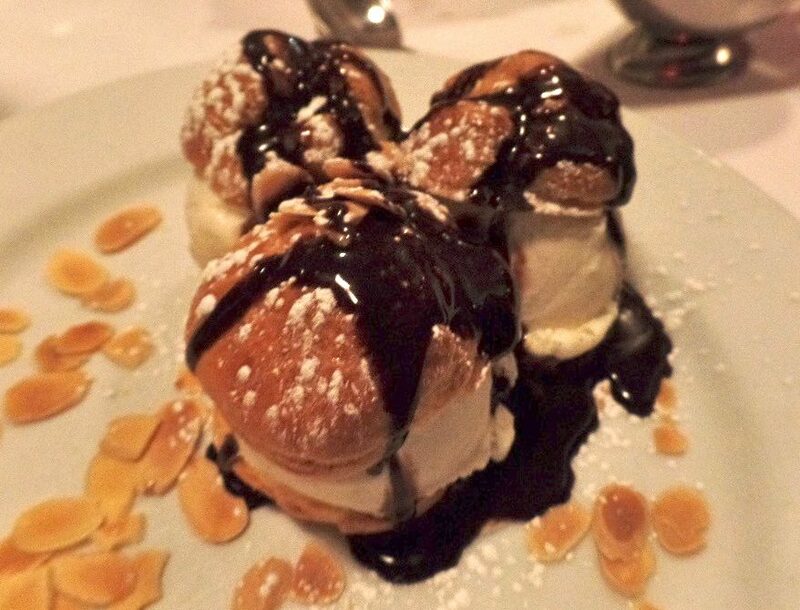 I finished off a very satisfying meal with a favorite French dessert that was too tempting to resist: Profiterolles au Chocolat ($11), a trio of perfect profiteroles, consisting of ultra-light and delicate choux pastry balls filed with vanilla ice cream, garnish with toasted almonds, and served with a dish of warm chocolate sauce to drizzle over the top. So indulgent! Other delectable desserts on the menu include Molten Chocolate Cake with Caramel Ice Cream ($11), Classic Crème Brulée with Cointreau ($10), and a delicious baked dessert made with fresh berries, Gratin de Framboises (Raspberry Gratin) for $11, among many more sweet choices. 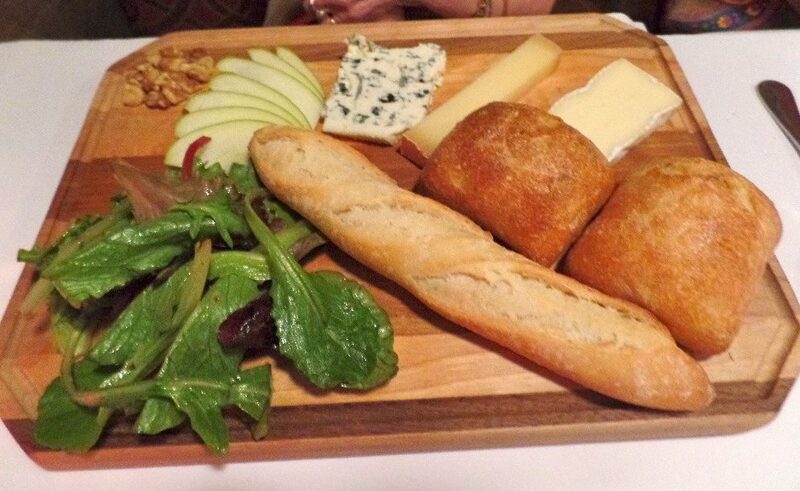 For those with not so much of a sweet tooth, Jubilee offers a cheese plate with your choice of three cheeses, accompanied by sliced fruit, nuts, field greens and an assortment of homemade breads — which would almost be ideal as a light lunch or afternoon snack! At the end of our meal, we were also presented with a small plate loaded with tiny homemade Madeleine cakes, still warm from the oven and dusted with confectioners’ sugar – what a very special treat! 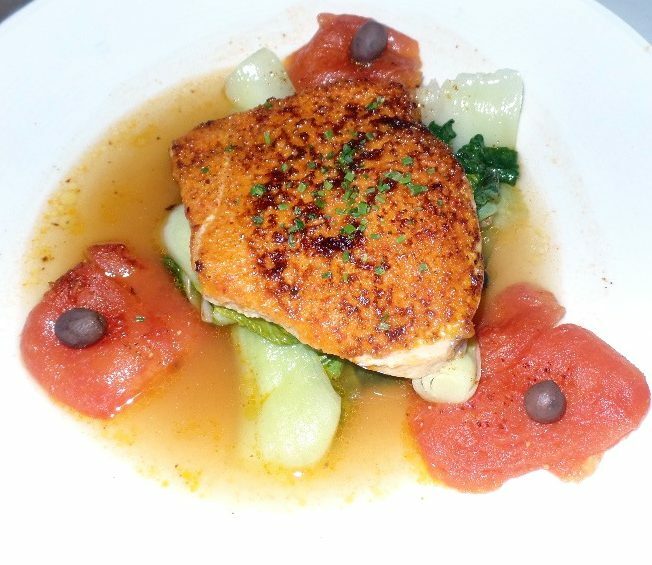 Jubilee has an extensive menu with dishes to please every palate. They also host a popular weekend Boozy Brunch ($28.50) that I would love to try with a few friends. 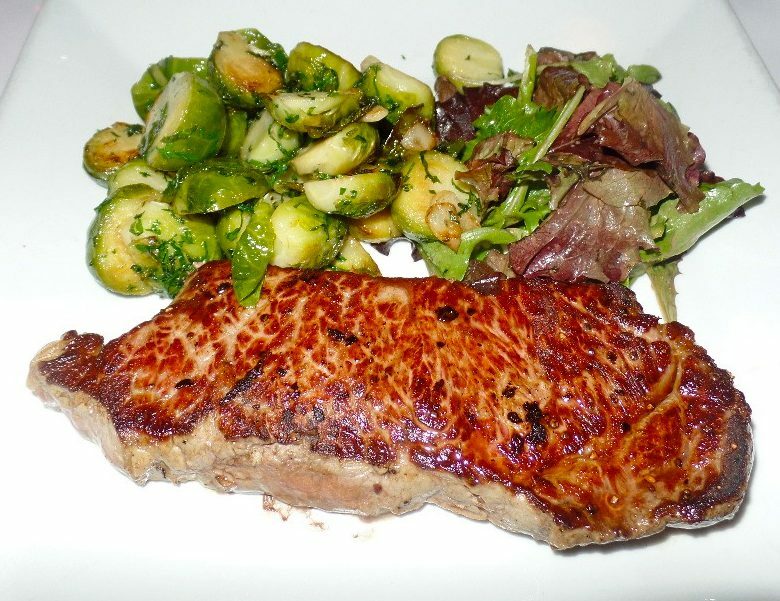 I’m excited to have discovered Jubilee, my new go-to place to enjoy all of my favorite French dishes and great service! Bon appetite! Jubilee is located at 948 First Avenue (at 52nd Street) in Manhattan. Phone: 212-888-3569. For reservations, menus, and more information, visit This Link!